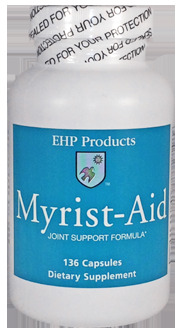 Myrist-Aid is a synergistic capsule which is taken with Myristin® and is designed to support and aid in absorption of Myristin®. When taken in combination with Myristin®, two capsules are taken with one Myristin® softgel before breakfast, three capsules with one Myristin® softgel before lunch, and three capsules with one Myristin® softgel before dinner for a total of three Myristin® softgels and eight Myrist-Aid capsules daily. A note to customers placing orders for shipment outside the U.S.A.:It is the customer’s responsibility to know Customs rules in the destination country. EHP Products is not responsible for packages held in or rejected by Customs. *These statements have not been evaluated by the Food and Drug Administration. Our products are not intended to diagnose, treat, cure, or prevent any disease.